WHAT IS IT? – What is a Generation Skipping Trust? A Generation Skipping Trust (GST) is a generic term for any trust where there are trust benefits which are skipping a generation. A typical example is where a Trustor establishes a trust that does not benefit his children but instead benefits his grandchildren. Thus, the trust “skips” giving anything to the Trustor’s children. The law imposes a “Generation Skipping Tax” of a flat 40% on certain transfers above an exemption amount to insure that property transfers are subject to transfer tax at least once at each generation. The exemption amount is the same as the estate tax exemption amount which for 2014 is $5,325,000. The relevant IRC sections are §2601 through §2642. 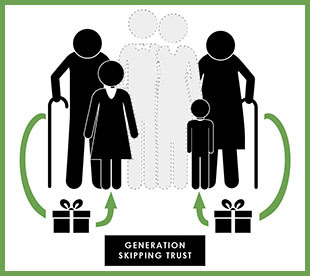 A “generation skipping trust” is not so much a type of trust that is set up for certain benefits but rather a catch-all generic categorization of trusts that either intentionally or inadvertently create generation skipping tax liability. Due to the current GST exemption of $5,325,000 for 2014 the topic doesn’t arise nearly as frequently as in earlier years when the exemption was much lower. Also, the computation and determination of the generation skipping tax is extremely complicated involving a number of different tax forms depending upon the situation. The law defines “skip person” as one who is a natural person or certain trusts who are the 2nd or more generation below the transferor. Thus, grandchildren are “skip persons”. Also, great-grandchildren are “skip persons”. Taxable terminations as defined in IRC §2612(a). These include terminations which occur by death, lapse of time, or by release of a power. A taxable termination is the conclusion of an interest in property held in trust unless (a) immediately after the termination, a non-skip person has an interest in the property or at no time after the termination may a distribution be made from the trust to a skip person. This is a more difficult concept to comprehend than a direct skip gift. An example of a “taxable termination” is given in the regulations at §26.2612-1(f), example 4. T establishes an irrevocable trust under which the income is to be paid to T’s child, C, for life. On the death of C, the trust principal is to be paid to T’s grandchild, GC. Since C has an interest in the trust, the trust is not a skip person and the transfer to the trust is not a direct skip. If C dies and is survived by GC, a taxable termination occurs on C’s death because C’s interest in the trust terminates and thereafter the trust property is held by a skip person who occupies a lower generation than C.
Taxable distributions as defined in IRC §2612(b). This means any distribution to a “skip person.” A simple example of this would be a transfer from a trust to a grandchild of the Trustor in the amount of $6 million. Of the $6 million, $5,325,000 is exempt so the taxable amount of the distribution would be $675,000. At the flat tax rate of 40%, the tax computes to $300,000. Note that if the parent of the grandchild is deceased, the transfer would not be considered a transfer to a skip person. Direct skips as defined in IRC §2612(c). This is a transfer subject to gift or estate tax but which is made to a “skip person”. An example of this would be where a Trustor gifts a property to his grandchild. Because the transfer is to a skip person, it is a direct skip and is subject to generation skipping tax to the extent that the gift exceeds the exemption ($5,325,000 exemption in 2014). For trusts or gifts which involve more than the generation skipping tax exemption ($5,325,000 in 2013) OR where there have been previous gifts which have used up the exemption, this type of tax can become an issue. 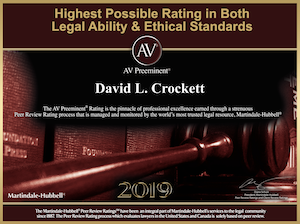 The situation of all trusts and gifts in this category must be examined each year to determine if there has been a taxable termination, a taxable distribution or a direct skip. The most common involvement of this in trusts is where a child who is a trust beneficiary predeceases the trustor which leaves the grandchildren (“skip persons”) as beneficiaries. Form 709, US Gift and Generation Skipping Tax Return, which is filed by the donor on or before April 15 in the year following the gift. Also, any gift or generation skipping tax is due with the return as well. (Note, this is a 5 page return with 18 pages of detailed instructions). Form 706-GS(T), Generation-Skipping Transfer Tax Returns for Terminations, which is filed by the trustee of any trust which had a taxable trust termination. The return and tax due, if any is due by April 15 in the year following the taxable trust termination. (Note, this is a 3 page form with 7 pages of detailed instructions). Form 706-GS(D), Generation-Skipping Transfer Tax Return for Distributions. This form is to be filed and the tax is to be paid by the recipient of the distribution. The return and tax due, if any is due by April 15 in the year following the taxable trust termination. (This is a one page form with 3 pages of instructions). Form 706-GS(D-1), Notification of Distribution From a Generation-Skipping Trust. This form is filed by the trustee of distributions from a trust which are subject to the generation skipping transfer tax. The purpose of this form is to report taxable distributions both to the IRS and also to the recipient of the distribution so the recipient can then prepare the form 706-GS(D) form. The return is due by April 15 in the year following the taxable trust termination. The computation and determination of generation skipping yax is perhaps the most complex and least understood in all of the estate and gift taxes. Expert assistance should be retained to deal with generation skipping trust situations. The information in this memo is for general informative purposes and may not fit every situation. You are cautioned to have any GST situation thoroughly reviewed and appropriate documentation prepared by legal counsel before you actually commit to it. The tax laws and IRS regulations are constantly changing in this area. Strict compliance with the required notices and the filing of tax returns and other administrative requirements are essential to be able to claim the tax benefits of a GST.